Pachislo Slot Machine now with LCD monitors. 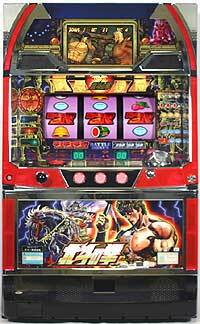 This machine allows the player to insert up to three coins, spin and stop reels and hope for a jackpot. Unlike a slot machine, a Pachislo offers the player control over the stopping of the reels through "skill stops" located on the front panel of the machine. Machine comes with 400 tokens. Great fun and excitement for entire family. ** Machines may vary in titles and themes from that shown.